The Uzbekistani authorities should stop harassing human rights activists, including those recently released from prison, and ensure their safety, Amnesty International, Civil Rights Defenders, Front Line Defenders, the International Partnership for Human Rights (IPHR), Human Rights Watch, and the Norwegian Helsinki Committee said today. Despite the authorities’ significant positive steps to improve the overall human rights climate in Uzbekistan, law enforcement bodies have stepped up their surveillance of some rights activists in recent weeks and are interfering with their peaceful human rights work. The government should ensure that human rights defenders and activists are allowed to carry out their work without interference or harassment. “The renewed surveillance and harassment of members of the human rights community in Uzbekistan puts significant strain on them and their families and causes re-traumatization and stress, which our organization witnessed firsthand when we visited Tashkent last month,” said Brigitte Dufour from IPHR. Since President Shavkat Mirziyoyev took office two years ago, the government has taken several important positive steps to improve Uzbekistan’s human rights record and uphold its international commitments. These have included the release of prisoners imprisoned on politically motivated grounds, judicial reforms, and the adoption of presidential decrees aimed, among other things, at improving the situation for civil society and easing restrictions on free expression. However, over the past month, the security services and police have been increasingly carrying out close surveillance of various human rights defenders, including those recently released from long prison sentences. The authorities are also intimidating those who demonstrate an intention to continue their human rights activities, including the rights activist Agzam Turgunov and the journalist Dilmurod Saidov (Sayyid). Both were released during the last year after long prison terms. They have been actively engaged in human rights monitoring and advocacy, and are seeking to register a nongovernmental organization, Restoration of Justice. Turgunov told the groups he first noticed that he was under surveillance on 15 October 2018 and that the surveillance has continued, despite statements by Uzbek officials that the surveillance would stop. On 20 October during a visit to Tashkent, IPHR representatives witnessed surveillance by people in civilian clothes on Turgunov’s home. Turgunov told IPHR that on 18 October, two representatives of the local mahalla (neighborhood) committee told him that police had been asking about his activities. He also reported that he later saw unknown people standing under his window, listening to his conversations, and that he saw several cars following him as he moved around Tashkent on public transport. Turgunov said that pressure increased when he travelled to Paris to attend the World Summit of Human Rights Defenders on 28 October. Authorities held him at Tashkent airport for two hours before his departing flight and detained him again for an hour upon his return. He was also summoned to the local prosecutor’s office in connection with an administrative violation he allegedly committed on 30 August when taking photos of a protest by prisoners’ relatives near the Supreme Court building. In June and July, provocative posts appeared on social media about Turgunov and Saidov claiming without any evidence or foundation that the two had received substantial foreign grants to criticize the government of Uzbekistan. In October and November, other posts appeared on Facebook accusing Turgunov of participating in criminal and radical groups, again without providing any evidence for these claims. These highly incendiary and unfounded accusations are troubling as they endanger the safety and wellbeing of Turgunov and his family, the groups said, and are aimed at discrediting the work of these courageous human rights defenders. 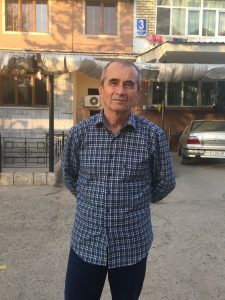 Dilmurod Saidov told rights groups that he has been indirectly warned by a “mediator” purporting to be from the human rights community about his continued active reporting on social media about torture and other human rights violations in Uzbekistan. The “mediator” also told Saidov that if he does not end his human rights work, he could be subjected to forced psychiatric treatment. Saidov also said that he and two other human rights activists, Tatyana Davlatova and Malohat Eshankulova, are under active surveillance by law enforcement bodies. In recent days, Eshankulova submitted her internal passport to authorities in Samarkand to obtain her residence registration. She told rights groups that when she applied, the authorities failed to provide her with any official paper temporarily certifying her identity, as is standard procedure, leaving her at increased risk of detention in the case of a police document check. Authorities are checking documents in Samarkand with increasing frequency because an international conference on human rights, the Asian Forum for Human Rights, is taking place there beginning 21 November. The Uzbekistani authorities should immediately stop the surveillance and harassment of human rights defenders and to ensure respect at all times for the fundamental freedoms of expression, association, and assembly, the groups said. The authorities should ensure that all Uzbekistani human rights defenders who wish to attend the Asian Human Rights Forum are allowed to do so.